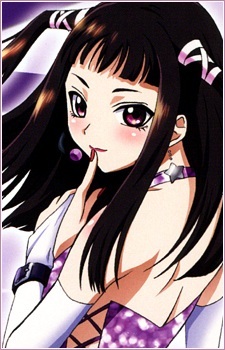 Height: 165 cm Weight: 56 kg Sizes: 97 - 59 - 83 Ruby Tojo is a witch from the human world who was part of a plot to destroy mankind as a response to a large garbage dump polluting her mistress' sanctuary. Her hate for humans stems from a car accident caused by a human drunk driver that took her parents' lives while the family was vacationing in the human world. Upon remembering the kind of love her parents had given her, she attempts to persuade her mistress to call off her plan but to no avail, as her mistress was bent on destroying the human world. She disappears after her mistress is defeated and put to rest, and reappears when Tsukune becomes out of control as a ghoul, aiding Mikogami in sealing his abilities. She now resides at Yōkai Academy as Mikogami's aide and continues to work for him in the second manga serialization. Despite not being an official student, she receives permission to become a member of the Newspaper Club. Exclusively in the anime, a running gag involves her randomly switching positions to help the school. When asked why, she states "many many things" have happened, though it is believed these are orders from Mikogami as a debt of gratitude for providing her with a new magic wand. It is later revealed in an omake that the reason why Ruby works under Mikogami is because of her infatuation with Tsukune, and by working at the academy, she could be near him. The anime omits the presence of her master or the inclusion of her parents, drastically changing the events surrounding her, including the reasons behind her return. Much of Ruby's magic revolves around a motif of ravens and flora, both as familiars and alternate forms for her to take, her most notable form being her having six raven wings with razor-sharp feathers on her back. Apparently, Ruby has shown that she is a masochist and the biggest pervert of them all during a training exercise for Tsukune to control his ghoul powers, even admitting to Tsukune a desire to be his "toy" while under the Lilith Mirror's influence. However, she also appears to have some feelings toward Ginei, as she undergoes 'private photo sessions' of him taking pictures of her in her underwear.